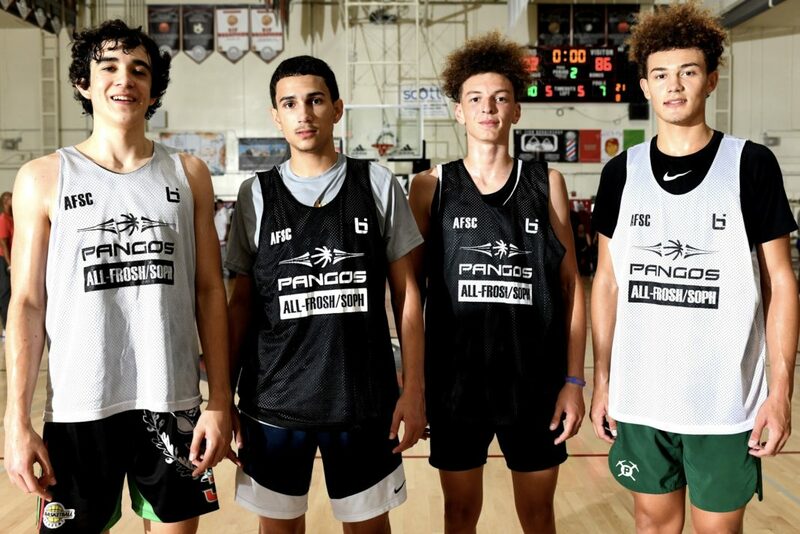 The 18th annual Pangos All-West Frosh/Soph Camp presented by Eastbay that was held at Westminster High School (CA) on September 22-23 featured approximately 210-plus top 2021 and 2022 players (along with a few talented 2022 ballers) from California, Arizona, Nevada, Utah, Washington, Alaska, Michigan and Pennsylvania. 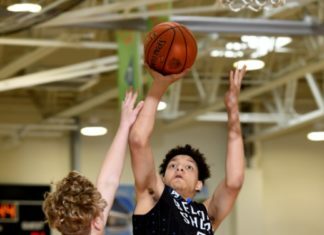 The depth of the talent present had media/scouts optimistic about the future of West Coast high school hoops and this platform gave talented young prospects in those classes a real opportunity to display their skills and future potential. Former long-time (20+ years) NCAA Division I college assistant Jason Levy opened the camp with an excellent fundamental skills session. Baller.tv live-streamed all games at the event (they are also now available for replay). Media and scouts on hand included camp co-director Dinos Trigonis (Fullcourt Press, Pangos & Nothing But Net Magazine), camp co-director Etop Udo-Ema (Fullcourt Press & Dunk News), Frank Burlison (BurlisononBasketball.com/McDonald’s All-American Game voter/NBPA Camp Selection Committee), Van Coleman (The Basketball Channel & Nothing But Net Magazine National Recruiting Analyst/McDonald’s All-American Game voter/NBPA Camp Selection Committee), Clark Francis (Hoop Scoop/McDonald’s All-American Game voter/ NBPA Camp Selection Committee), Eric Bossi (Rivals.com/Yahoo Sports/McDonald’s All-American Game voter), Ronnie Flores (GrassrootsHoops.net & BallisLife.com/Fab 50 National HS Team Rankings), John Stovall (ESPN.com), Joel Francisco, Devin Ugland & Aaron Burgin (PrepHoopsSoCal), Dave Keefer (California Preps), Josh Gershon (247Sports.com), Chris Popoola (PremierBall.com), Gregg Rosenberg (Arizona Varsity), Jerina Madayag (PremierBall.com), Adam Calleja (Nothing But Net Magazine), Ed Sandoval (MOSLive.com), Chris Young (Nike Grassroots Basketball), Baller is Life, OverTime, Slam Magazine and Scott Kurtz (Kurtz Photo). 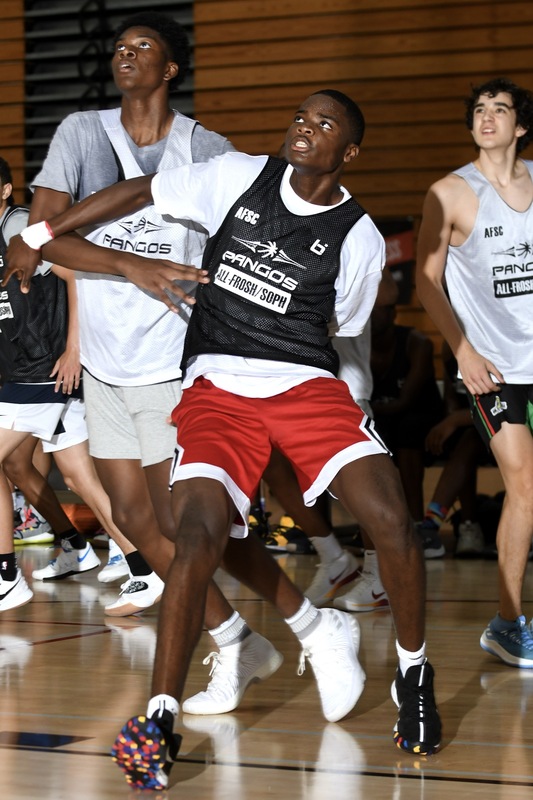 As always, the camp’s top 60 players were selected by the media/scouts in attendance and were showcased in the two “cream of the crop” games held at the conclusion of the event. In the Top 30 Game, overall camp Most Outstanding Player 6-4 2021 Devin Askew came out of the gates on fire along with Top 30 game co-MVP 6-3 2021 Isa Silva. Their early hot hand sparked their White squad to an early 22-3 lead over the Black team before 6-2 2021 TJ Wainwright’s came off the bench and provided instant offense (4 straight “threes”) to make the contest competitive. Wainwright would score 14 of his team-high 18 points in the 1st half and that led the Black squad to claim a 54-50 lead at the break. Silva (26 points including 4 second half 3s) and Askew (20 points) grabbed control of the game again after the break and pulled away for a 102-86 win. Top 30 Game co-MVP 6-1 2022 Rickie Isaacs Jr. contributed 14 points for the Black team, most of that offensive production coming from deep range. In the Top 60 Game, the White squad edged their Black counterparts 106-104. 2022 Dylan Andrews, 2021 Mike Anderson, 2021 AJ Burgin and 2021 David Elliott were the stand-outs. Andrews (who had a game-high 24 points) has potential to be a big-time scoring combo-guard. Anderson (a Philly native) is a tough PG that can make shots (scored 20 points). Burgin (11 points) is a savvy guard with improved 3-point range (had 3 “threes”) and Elliott is a young and crafty scoring guard (14 points). While this is a recap of the event, please keep in mind that this is a very early look at underclass prospects that have much room for future growth and are all “unfinished” products. 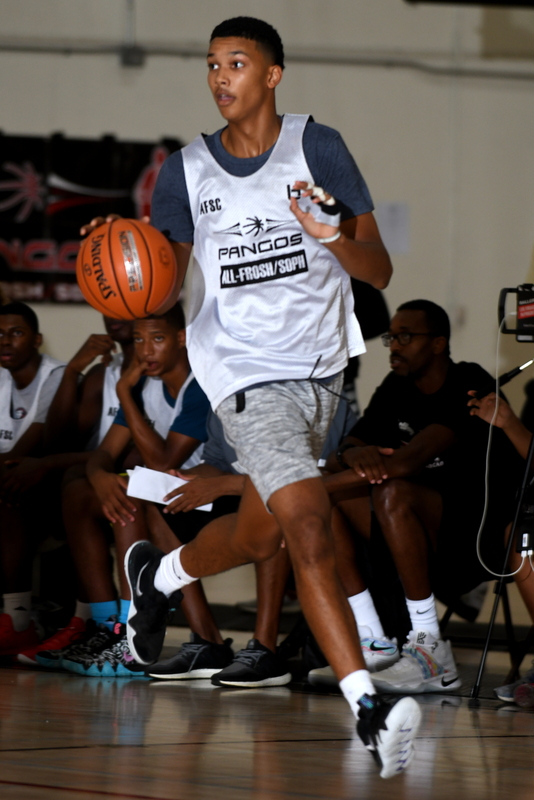 Henri Adrissa 6’10” 2022 Crossroads (Santa Monica CA): Athletic and hardworking young center is barely scratching the surface of his immense potential. Cameroon native pounds the boards like a sledgehammer and is a formidable rim-protector. As his offensive skills mature, he will evolve into a priority HM national recruit. DJ Allen 6’5″ 2021 St. Anthony (Long Beach CA): Athletic forward is active around the rim and has nice ability to extend defenses with a smooth perimeter jump shot. Has just transferred to St. Anthony HS after spending his freshman year at Mary Star (San Pedro CA). Christian Bento 6’11” 2021 Great Oak (Temecula CA): Very improved young center with very nice length runs floor well and competes well on the boards. Good student (3.2 GPA) has nice touch around the cup. 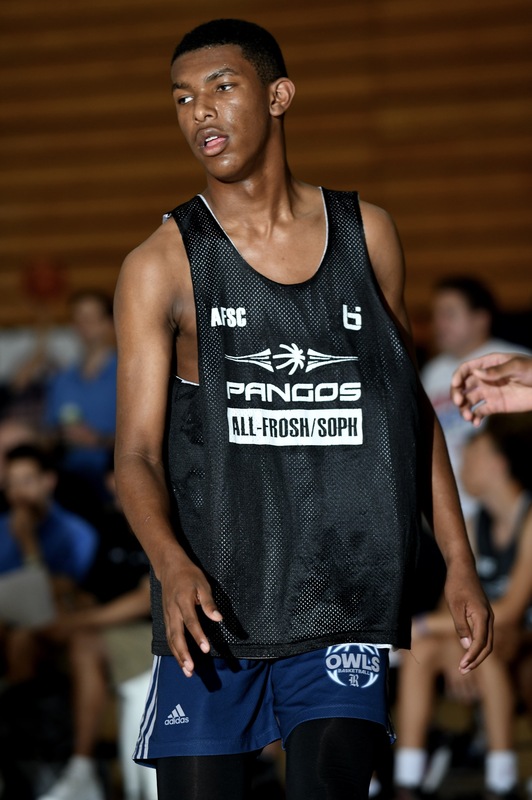 Will be an attractive prospect that mid-high majors should track. 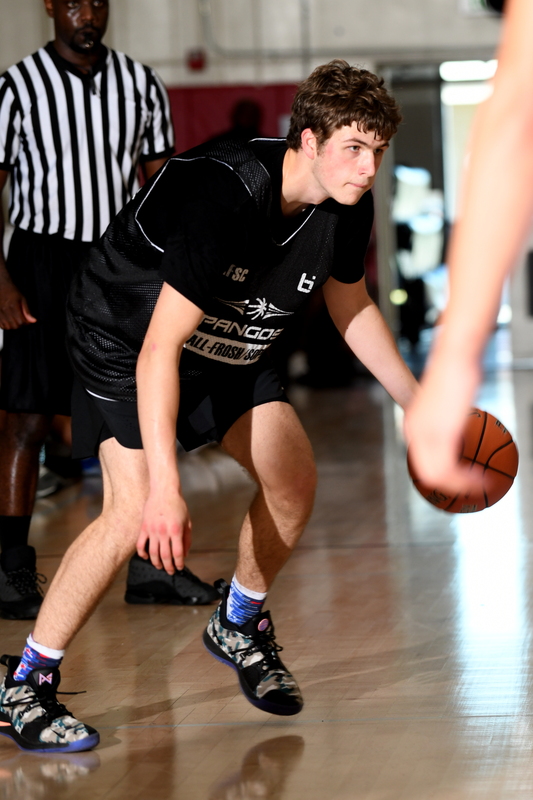 Wilhelm Breidenbach 6’9″ 2021 Mater Dei (Santa Ana CA): Post moves like Kevin McHale, motor like Kurt Rambis, Breidanbach is a “throw-back” type PF that is very difficult to stop on the block and his high motor produces consistent results on both ends of the floor. Excellent student (3.85 GPA) was the top 2021 post prospect at this camp. USC and Cal are among the growing number of schools offering and that list will definitely grow longer before it gets shorter. 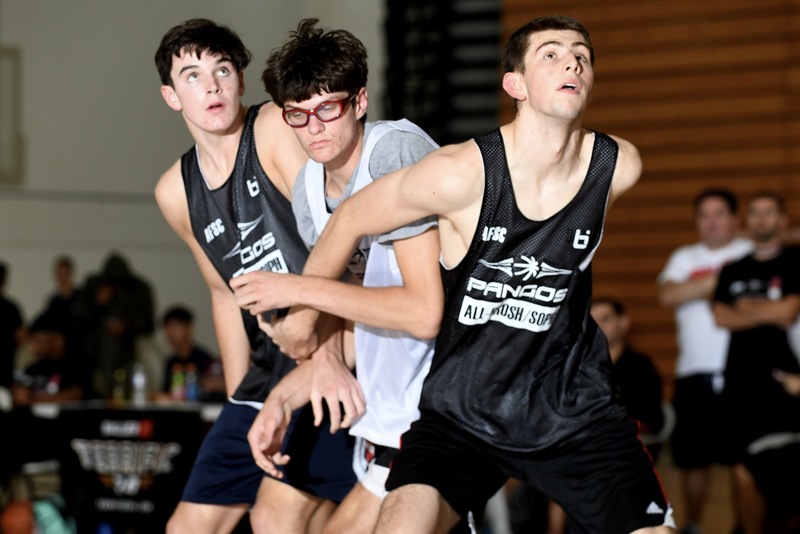 Paxton Burzell 6’7″ 2021 JSerra (San Juan Capistrano CA): Active and agile hybrid-forward is a regular visitor on the glass and can score in traffic. Good student (3.2 GPA) and terrific kid. Deiman Reyes Cassiani 6’9″ 2021 Veritas Prep (Santa Fe Springs CA): Very physical PF competes on every play and is a rugged rebounder and shot-blocker. Columbia native just arrived in the United States a few months ago. John Christofilis 6’4″ 2021 O’Dea (Seattle WA): Skilled WG has deceptive ability to soar to the rim as well as an accurate outside touch. Very good student (3.6 GPA) has offers already from Washington and Grand Canyon. De’Vontes Cobbs 6’3″ 2022 Shadow Mountain (Phoenix AZ): Athletic slashing scorer has no problem finishing high above the rim. Wisconsin native and very good student (3.6 GPA) has been invited to upcoming USA Basketball Mini-Camp in Colorado Springs CO.
Frankie Collins 6’1″ 2021 Clark (Las Vegas NV): Crafty scoring combo-guard has ability to put points on the board. Very good student (3.7 GPA) had 9 points in Top 30 Game. Nicholas Davidson 6’8″ 2021 Santa Margarita (CA): Heady and skilled PF has nice 3-point range. Good rebounder is a fabulous student (4.1 GPA). Zaon Collins 6’0 2021 Bishop Gorman (Las Vegas NV): Very smooth table-setting PG has great court instincts and top-shelf decision-making ability as well as passing skills. Solid student (3.0 GPA) is a bona-fide winner that has and will continue to attract high-major interest. Washington, UNLV, TCU, Southern Miss and Western Kentucky among those programs that have offered. Was also instrumental in leading Bishop Gorman to championship of recent Ron Massey Memorial Fall Hoops Classic over a strong field that included runner-up Bishop Montgomery, Mater Dei, Rancho Christian, Corona Centennial, Harvard-Westlake, Santa Margarita and Coronado/Henderson NV. 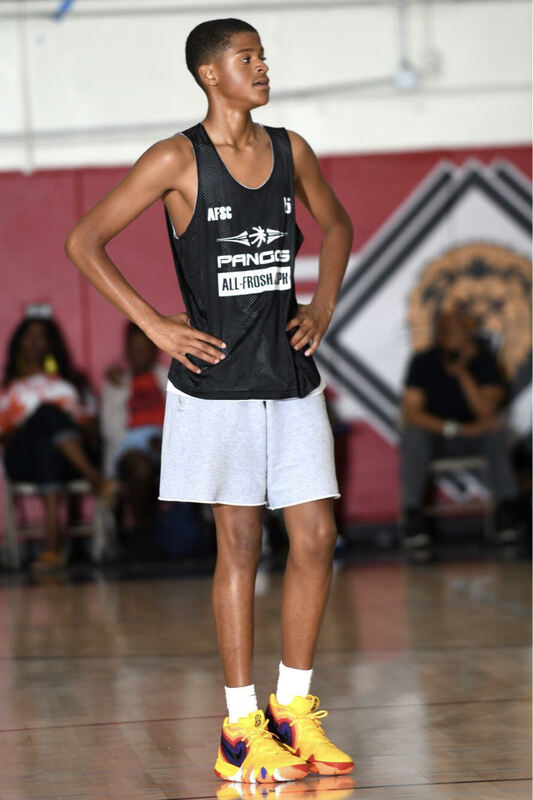 Kennedy “Reece” Dixon 6’4″ 2021 Dorsey (Los Angeles CA): Very improved athletic wing is a threat to slash and score and can knock down perimeter shots. Excellent student as well (3.7 GPA) had 13 points in Top 30 Game. Intriguing West Coast sleeper in sophomore class. Orlando Greenlow 6’5″ 2023 Santa Monica (CA): Strong and muscular young wing can finish at the rim despite contact. HM name for the future. Jason Hart II 6’1″ 2022 Dorsey (Los Angeles CA): Quick and savvy floor-general loves to get his teammates involved and is an excellent leader on the court. Elusive ballhandler and pin-point passer. Son of Jason Hart (Syracuse/NBA PG and current USC assistant coach) is also an excellent student (4.0 GPA). Harry Hornery 6’8″ 2021 Mater Dei (Santa Ana CA): Australian import is a skilled face-up forward with nice agility baseline to baseline. Joseph Hunter 6’3″ 2022 San Joaquin Memorial (Fresno CA): Strong and physical wing guard with top-notch perimeter shooting ability (had 2 “threes” in Top 30 Game. Will be a great compliment at SJM to super 2020 guard Jalen Green. 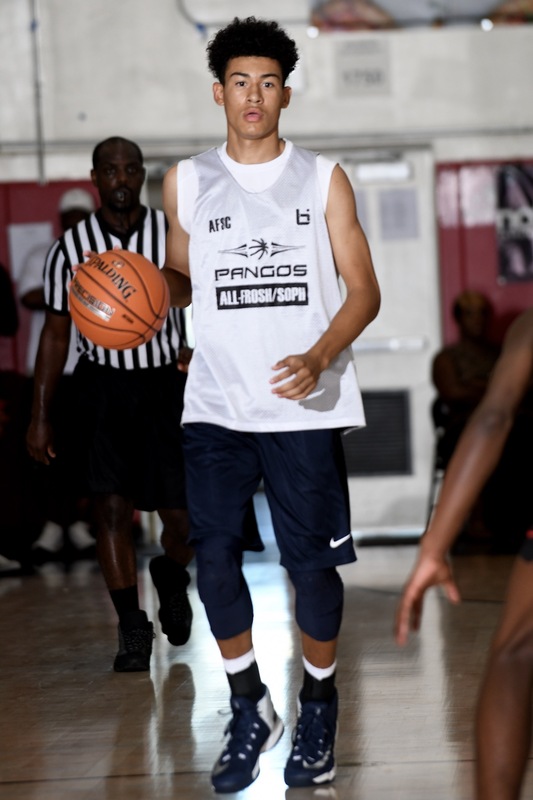 Chris Howell 6’6″ 2021 San Marcos (San Marcos CA) Smooth lead guard with very nice length has the passing skills and requisite decision-making ability to play on the ball and the versatility to play off it. Excellent student too (3.8 GPA). Richard Isaacs Jr. 6’1″ 2022 Coronado (Henderson NV): Rickie is quickly establishing himself as one of the elite PGs in the 2022 national class. Extremely cerebral and with a “quick as a cat” burst off the bounce, “Pop Pop” is not only dangerous as a scorer but also quite effective as a creator for teammates as well. Had one of the top individual shooting performances of the camp when he nailed 6 straight “threes” to finish 7/8 from beyond the 3-point arc in that game (28 points). Issacs was the best freshman performer in the Top 30 Game, torching defenders with pull-up jumpers en route to 14 points and earning a share of Top 30 Game co-MVP honors. 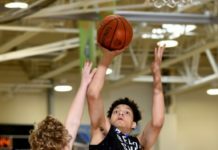 Rivals.com’s Eric Bossi on Isaacs: “he is only a freshman but has already built himself quite a reputation for being ready to play anywhere against anybody and putting up numbers.” Along with Kijani Wright, Isaacs was one of the top two 2022 prospects at this event. 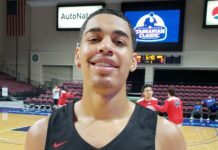 Rickie has early offers from UNLV, Cal, Oklahoma, Rutgers and Stetson and is slated to attend the upcoming USA Basketball Mini-Camp in Colorado Springs CO.
D’aunte (DJ) Johnson 6’5″ 2021 Moreau Catholic (Hayward CA): Long and rangy WF finishes well in transition and is a very good defender. Jahmai Mashack 6’4″ 2021 Etiwanda (Etiwanda CA): Mashack, arguably the camp’s best defender, has realty improved his scoring skills as well. Athletic wing has a terrific work-ethic, attitude and desire to compete! Very good student (3.5 GPA) is the son of former Loyola Marymount player Elton Mashack (who played his HS ballat Bishop Amat/La Puente CA). Jorge Ochoa 6’7″ 2022 Orange Lutheran (Orange CA): Skilled and versatile scoring forward with nice perimeter range on his jump shot as well as the strength to finish at the rim. Ochoa has also improved his defense and rebounding. Playing style reminds me of a young Kelly Tripucka (former Detroit Pistons star). Christian Moore 6’4″ 2022 Brentwood (Los Angeles CA): Athletic young WG with excellent ability to get to the cup off the dribble also has the physical tools to be a top-tier defender. HM potential. Had a respectable 8 points in Top 30 Game. Marsalis Roberson 6’4″ 2021 Bishop O’Dowd (Oakland CA): Athletic and energetic WF with real ability to be a defensive stopper. Very good student (3.8 GPA) had 9 points and 2 very impressive blocked shots in Top 30 Game. Isael “Isa” Silva 6’3″ 2021 Jesuit (Carmichael CA) Silva was arguably the biggest revelation of the event and fantastic all camp long and he topped it with an effort for the camp history books in the Top 30 Game: game-high 26 points (4 of his 7 “threes” came in 2nd half when his team pulled away for the “W”) to go along with 4 rebounds and 4 assists. That dazzling offensive display earned Isa Top 30 Game co-MVP honors. Steve Nash-style point guard has very nice ability to create for himself or teammates including a great perimeter stroke & precision passing ability. Off the charts honors student (4.2 GPA) is already on the radar of Stanford (will unofficial there next weekend), Cal, USC, Utah, Marquette, Nevada and St. Mary’s and that list will definitely get longer based upon the buzz he has received from his outstanding camp performance here. Anthony Swift 6’5″ 2021 Desert Pines (Las Vegas NV): Bouncy swingman with underrated 3-point shooting ability. Grant Tull 6’5” 2021 Gridley (Gridley CA): Heady WF is a “jack of all trades” player that impacts the game on both ends and this lefty is very effective in the offensive half-court with an accurate pull-up mid-range jump shot. Luke Turner 6’6″ 2021 Rancho Christian (Temecula CA): Sharpshooting wing-forward is dangerous beyond the 3-point arc. Very good student too (3.7 GPA). Tsalta “TJ” Wainwright 6’2″ 2021 Santa Monica (Santa Monica CA): Dangerous 3-point lefty flamethrower has George Gervin ice in his veins when he pulls the trigger from deep range. Fantastic shooting display in Top 30 Game (had 4 straight “threes” when he entered game en route to 1st-half best 14 points/18 points total) to earn share of Top 30 Game co-MVP honors. Good student (3.3 GPA) is also an underrated rebounder (4 boards in Top 30 Game) and plays very hard on the defensive end. Started as a freshman last year at Culver City HS while playing for Reggie Morris Jr. (now an assistant at Pepperdine) and has now transferred to Santa Monica HS for his sophomore season. 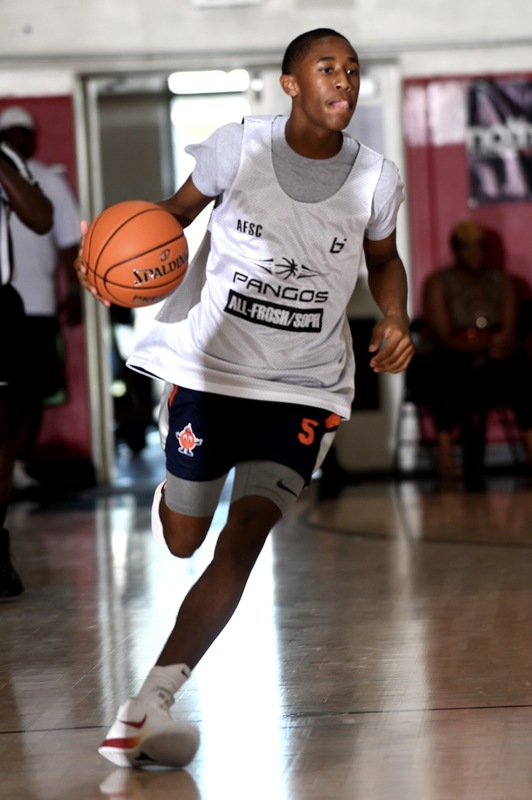 Christopher Washington 6’3″ 2021 St. John Bosco (Bellflower CA): “Scotty” is a versatile combo-guard with very good ballhandling and scoring skills and the propensity to make stops on the defensive end. Bears a striking resemblance (body & face) to former UCLA/NBA PG Darren Collison. Dad is Chris Washington (who played at Cal with former NBA star G Kevin Johnson) and grandfather is the late Issy Washington (founder and director of the SoCal-based Slam-n-Jam tourneys and leagues). Good student (3.2 GPA) too. Kijani Wright 6’8″ 2022 Windward (Los Angeles CA): Extremely promising young forward has the skills to be an impact player on the next levels. 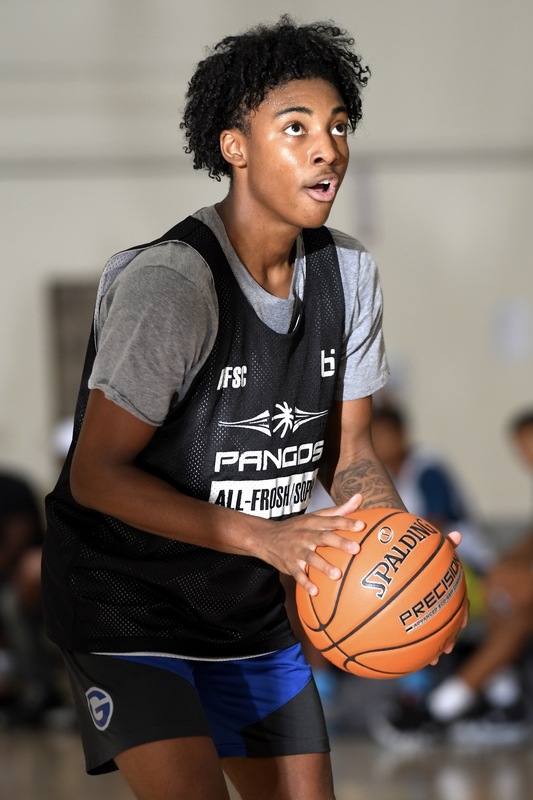 Athletic in transition and with a very polished pull-up jump shot, Wright topped off an impressive camp with a 9 point/6 board performance in Top 30 Game. 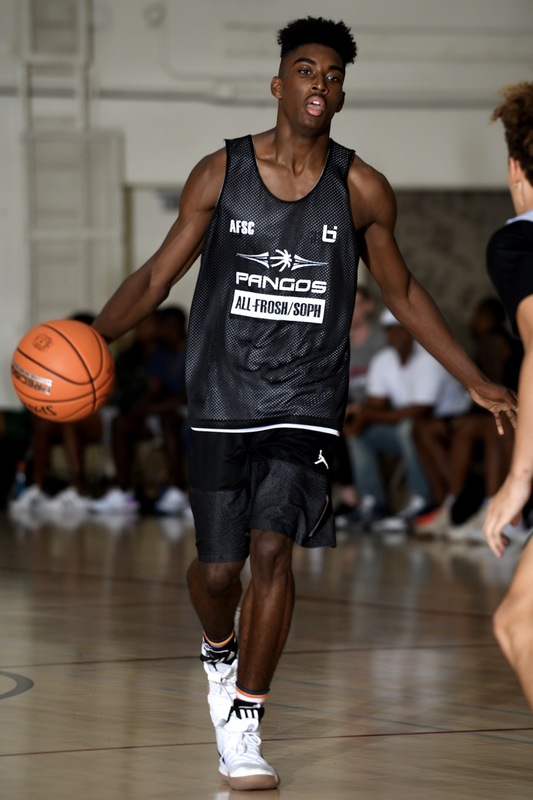 Kijani has been invited to the upcoming USA Basketball Mini-Camp in Colorado Springs CO. USC, Cal and UNLV have already offered Wright (a very good student) who projects to be an elite national recruit.